Snoring can be an uncomfortable topic for most people to bring up, especially to their dentist, but at Point McKay Dental, we are pleased to offer North West Calgary Custom Snore Guards to help everyone in your family, including yourself, get a good night’s sleep. A Snore Guard a device used to prevent snoring. Snore guards are designed based on the theory that when your jaw is positioned forward, the size of your upper airway increases, reducing the air resistance that leads to snoring. By positioning your lower jaw forward, snore guards have been proven to stop airway obstruction to reduce or stop your snoring. 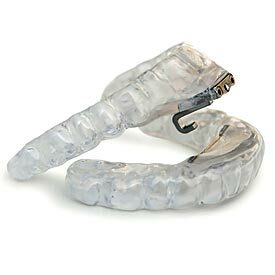 Snore guards are custom made specifically for you, using an impression of your top and bottom teeth. We will send these impressions to our dental lab where it is created to fit snugly over your top teeth while you sleep and reposition your lower jaw into a comfortable position. Make sure your new snore guard is cleaned with cold water and a toothbrush, before and after each use. Always store your snore guard in the case provided to allow air circulation and to prevent damage. Keep your snore guard away from hot water, direct sunlight, and hot temperatures to prevent distortion of its shape. Snore guards will wear throughout its use. If you detect any holes, wear or tears or if it becomes discomforting to wear, please contact us to have it examined. We know a good night’s sleep is important for your overall health and wellness which is why we offer North West Calgary Snore Guards to help you eliminate your snoring. Call us today at (403) 283-7829 to schedule your appointment with Dr. Paul Hul to learn more about your options for North West Calgary Snore Guards at Point McKay Dental Care! Call us at (403) 283-7829 to book your Snore Guards Consultation with us today!